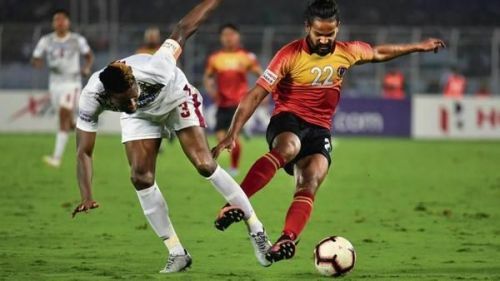 East Bengal's star striker Jobby Justin has caught the eye of top Indian Super League (ISL) clubs after an impressive I-League 2018-19 season with the Red and Golds. 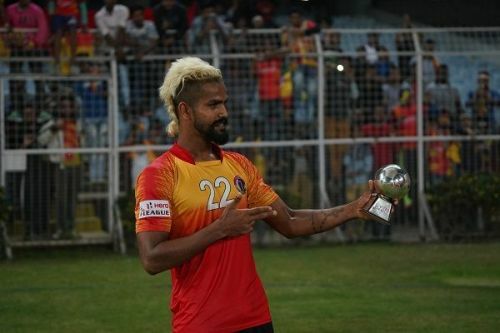 Jobby Justin is the highest Indian goalscorer in the I-League (and top Indian football leagues) with 9 nine goals in 16 matches for East Bengal. He scored in both legs of the Kolkata Derby against Mohun Bagan this season. While his overhead kick to score East Bengal's second goal in the first fixture on December 16 made him a fan favourite, an assist and a header in the second leg on January 27 established him as one of the best Indian strikers in the league. Jobby had only 2 goals in 9 caps for East Bengal last season but under Alejandro Menendez this time around, he has lifted his game to a whole new level. This has seen him attract big offers from at least five ISL clubs for the 2019-20 season, according to a source. The talks with ATK, in particular, are at an advanced stage. Considering that Jobby is used to Kolkata football by now, a move to ATK next season cannot be ruled out. According to the LiveMint, the player could earn anything between Rs 50 lakh and Rs 1.5 crore per year. Jobby was brought to East Bengal in 2017 after a club official, Alvito D'Cunha, spotted him at a Kerala Premier League (KPL) match. The first season may have been a mixed one for Jobby but there's nothing stopping him now. Menendez appears to be one of the reasons for Jobby's resurgence on the pitch. The Spaniard even thinks Jobby deserves to play in the Indian national team. "He’s playing very well in the box, outside the box and in the middle as well. Right now, he’s a more complete player than he was last season and if he continues to play like this, he’ll deserve to play in the national team," Menendez had said after the 2-0 Kolkata Derby win last month. Jobby's contract expires at the end of this season with East Bengal. The talks are already on to help him scale new heights with an ISL club.